Golf has long been called a gentleman’s game, and a game played on the highest level of honesty. The same can be said for those who work around the game as well. That was never more evident than when a story came out earlier this week down in Miami Beach, Florida when a worker found a bag full of money on a golf course. Rachel Castillo was working her shift at a Miami Beach Golf Club , not far from where the PGA Tour plays the WGC Cadillac Championship at TPB Blue Monster, when she stumbled upon a bag full of cash back on January 20. That is a nice chunk of change. But rather than keep it for herself and not say anything, Castillo contacted the police and handed the bag over to authorities. Inside the bag, police found the identification of a 76-year-old man who the bag belonged to. Police have had nothing but the nicest things to say about Castillo, but as far as she is concerned, she didn’t think she did anything out of the ordinary. Of course, for those of you golfers paying attention to the amount of money, it would be a perfect amount for a $2,000 bet on every hole right? Playing for $36,000 is a heck of alot more than most of us will play for in our lifetime. As for the money, police are in the process of returning it to the rightful owner, who is said to be living in an assisted living home. The reason why the man had that much cash in a bag is not exactly known, though through contact with family members of the man it was accumulated from several transactions. If the rightful owner of all that money had not been found within 90 days, then Castillo would have been able to keep it. While she is probably happy she did the right thing, you have to think that in the back of her mind somewhere she was hoping that the 90 days would expire, right?? 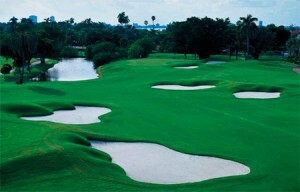 This entry was posted in News, Opinion and tagged miami beach golf club, rachel castillo on April 24, 2013 by Bryan.